CET Pet Toothpaste helps your pet keep his teeth clean on gums healthy. Periodontal disease affects 85% of adult dogs and cats. This can lead to pain, bad breath and tooth loss. Even worse, chronic oral infection can spread harmful bacteria to other parts of the body, including the lungs, heart, liver and kidneys. Fortunately most periodontal disease is preventable through a program of oral hygiene and regular professional care. CET Chews are beefhide treats to which an enzyme has been added that helps stop plaque from forming. PLUS the natural abrasion of rawhide chews help clean your dogs teeth. Available in two sizes (small/medium and large). Order CET Chews and give your pet the clean mouth it wants! CET Pet Toothpaste helps your pet keep his teeth clean on gums healthy. Periodontal disease affects 85% of adult dogs and cats. This can lead to pain, bad breath and tooth loss. Even worse, chronic oral infection can spread harmful bacteria to other parts of the body, including the lungs, heart, liver and kidneys. Fortunately most periodontal disease is preventable through a program of oral hygiene and regular professional care. .
Virbac C.E.T. enhances and activates naturally occurring oral defense mechanism. C.E.T. dental products are a great tasting and effective way to help keep your pet's breath fresh and teeth clean. 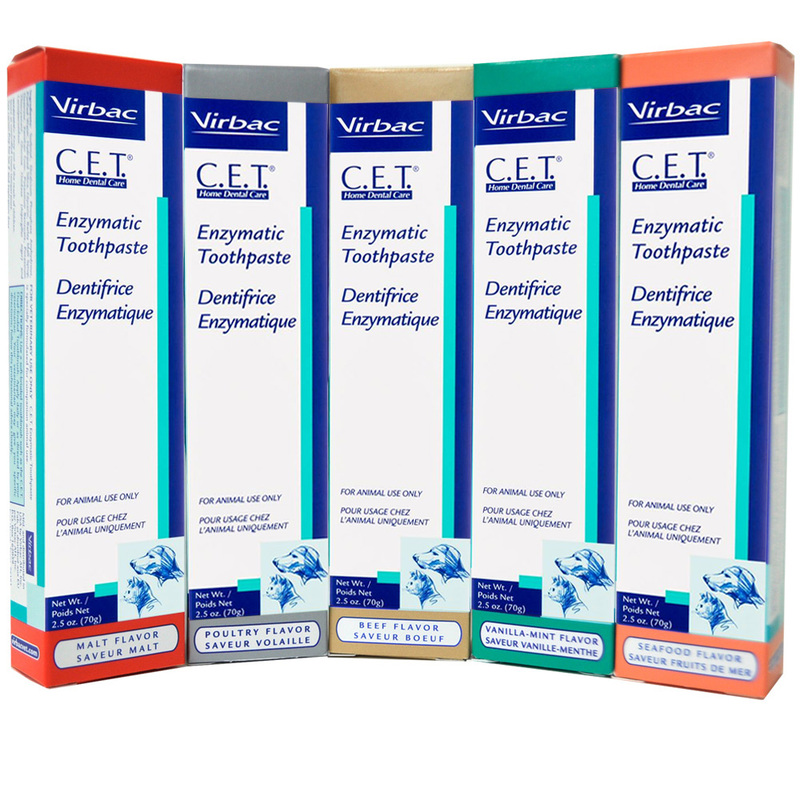 Order CET dental products today! C.E.T. Chews enhance and activate a naturally occurring oral defense mechanism. C.E.T. Chews are a great tasting and effective way to help keep your pet's breath fresh and teeth clean.